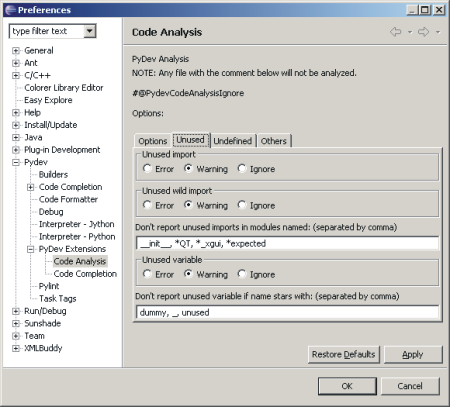 Code analysis provides error finding in python programs. It finds common errors such as undefined tokens, duplicated signatures and warns about things such as unused variables or unused imports. Bad indentation (incorrect number of spaces when indenting). It can analyze your modules while you are coding, and not just when you have the module saved in your disk. It is 'very' fast when compared to current alternatives. NOTE 1: You may still configure PyDev to analyze your code only when you save a file if you want. NOTE 2: You have to disable PyLint manually if you don't want to use it anymore. Its options should be self-explanatory, so, if you have some doubt, please drop a note in the PyDev forum. The output is shown as error markers in the editor itself (you may hover over it to see the description). IMPORTANT 1: The undefined variable errors produced are used as an input for a content assistant that allows you to fix it. Check the PyDev Content Assistants page for more information on that (it also explains how you can give 'notes' to the code analysis so that it ignores some error or warning). IMPORTANT 2: You are advised to leave the 'auto-build' turned on (in the menu: project > build automatically). If you however want to leave it off, you have to remember to make a build when you want your changes analyzed. IMPORTANT 3: When you change the interpreter or change your pythonpath, your files are not automatically analyzed. If you want them analyzed after that, you have to manually do a 'clear' on the projects you want analyzed (in the menu: project > clean...). Currently code-analysis does lots of analysis so that invalid signs are not raised, but some signs are nearly impossible to detect when doing static analysis, so, in some cases some flags may be added to the code to give more info to the code-analysis and make it behave better. Description: Used to indicate that a class has dynamic attributes (so, code analysis won't complain about undefined variables when accessing any attribute from that class.